caravan- a company of people / caravanserai - a place where caravans meet. 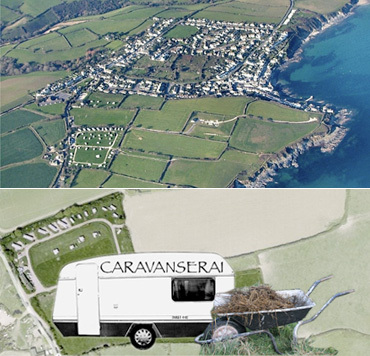 Caravanserai is a residency project initiated by Annie Lovejoy & Mac Dunlop at Treloan , a caravan and camping site situated on the Roseland peninsula in Cornwall. Working with the owners Pete & Debs Walker, we’re cultivating a plot in Middle Close (the project field ) and establishing a residency space (the project van ) to facilitate activities that engage with, and celebrate the local..